There was a time when, a gentlemans education was not complete until he had mastered the art of carving. Those days are long since forgotten. By 1928, Emily Post had dropped the section on carving from her book on etiquette all together. Many a noble bird has been hacked to shreds at the hands of unskilled knife-wielding relatives and friends, as horrified cooks looked on. This year  avoid the public carnage. Learn the simple art of carving like a pro. Whether the bird is carved in the kitchen or at the dining room table, it simply must be done before anyone can eat. And its not that difficult. Tools  Meat fork with long tines, sharpened carving knife or chef's knife, small cutting board on the side and a kitchen towel or napkin. Allow the turkey to rest 20 minutes after cooking. This lets juices saturate the bird evenly again for better slicing. Remember that you must cut the bird apart at the joint, hacking though the bone is not an option. With an air of confidence, start with the dark meat. 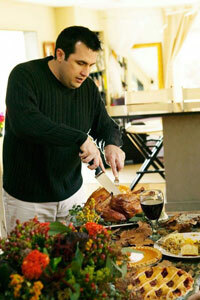 Secure the turkey at the breastbone with a carving fork or better yet, use a folded napkin. Cut through the skin between the leg and body. Press the leg downward until it is lying flat against the platter. Now you can see the hip joint. Cut through the joint and remove the leg and thigh to a cutting board. Cut the thigh and drumstick apart at the joint. Remove the skin and slice around both sides of the thighbone, removing the meat. Leave the drumstick whole. Repeat on the other side. For the breast: Hold the turkey with a large fork at the breastbone. Slice about 2 inches down one side of the breastbone, gently separating the meat from the bone. Now make a horizontal slice across the grain of the meat. Remove the entire section of breast meat to a cutting board. Holding with a fork, cut into slices. Place slices on platter. Repeat process on the other side. For the wing: Cut into the joint slightly above the wing and remove it to the cutting board. Cut the wing in two pieces at the joint. Slice from the meaty part or serve whole. Save the tip for soup. For the drumstick: Cut slices parallel to the bone, turn and repeat. Practice on a chicken during the off-season. Nothing to it! Turkey is the most popular entrée for the holiday season and its arrival at the table is the highlight of the meal. Whether you carve the turkey at the table or in the kitchen, sharpen the knife and get to it. Happy Holidays.